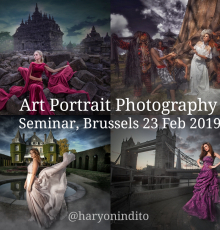 In this seminar I will explain the creative process of producing art portraits, starting from choosing the concept/locations/ models/dresses, the execution (composition, lighting, etc.) and the general principles of post-processing (Photoshop). An introduction of using off-camera flash (OCF) will be included. The seminar will be held in a cosy and intimate venue with limited audience. The venue ‘Bon Jour’ is located in the centre of Brussels, 5 minutes’ walk from Place Jourdan. We will spend the afternoon learning together over coffee your favourite subject, art portrait photography. After the seminar, you will have new knowledge that you can apply immediately in your next photoshoots.